* $59 per day special based on minimum four (4) day hire. All people movers have CD players & are expertly maintained with air-conditioning, power steering & some with cruise control. Included in the price is a 24 hour breakdown assistance. All have tinted windows to protect you and your family from the Gold Coast sun. Some of the people movers have sonar detectors to warn the driver when too close to objects. 8 Seater Nissan Elgrand or 8 Seater Toyota Tarago. Both these models boast automatic air conditioned and power steering tinted windows and parking sensors. Note: If you are planning for a Group please let us know. That way we can make sure you have the right car for the right number of people. Your safety is our primary concern. 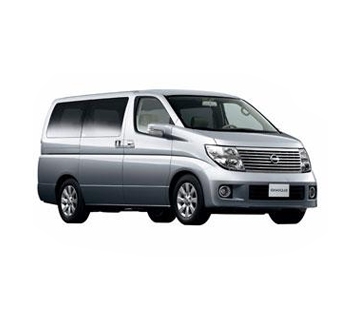 We recommend the People Movers to anyone who wishing to rent a car who has a large amount of luggage or who plans on touring with teenagers or a group of friends. Having a larger engine makes touring more comfortable & for a car of its size the People Movers have great fuel economy. Taking advantage of our Off Peak Rates means you can afford to hire a People Mover for just a few dollars more per day then the standard wagon. That is why the People Movers are one of our most sought-after car rental options. Space, comfort & the peace of mind knowing all our vehicles come with a free 24 hour breakdown assistance, means you can simply enjoy your next Gold Coast holiday or business without the usual worries associated with car rentals. Book your next Gold Coast Car Rental with Jetsetter Car Rentals and be sure of a safe car.